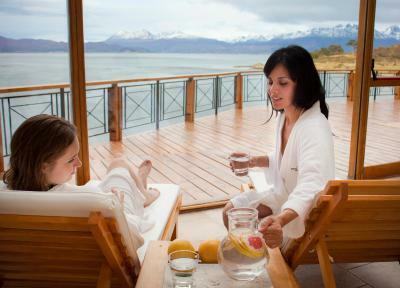 Lock in a great price for Los Cauquenes Resort + Spa + Experiences – rated 9.2 by recent guests! Everyone and everything exceeded my expectations at Los Cauquenes. The staff were incredibly friendly and helpful. The room and all the other facilities were exceptional. I enjoyed the fitness center-it was well equipped with quality, up to date equipment. The location and views were stunning. I travel a lot and Los Cauquenes is one of the best if not the best hotel I have ever been at. Keep up the great work Los Cauquenes! The staff were simply incredible. Beautiful facility, right on the Channel. Gorgeous views. Beautiful interior finishes. Great spaces. A very nice hotel Situated just out of town on the beach. Room are nice and big. Bathroom is nice. View is amazing. The stuff is superb. Have a heated pool, jacuzzi , dry sauna, Big gym. Highly recommend. Gorgeous place! The location is perfect, away from town (but with a convenient shuttle) and on the water. Staff were really kind, accommodating and talented. Breakfast was exceptional. 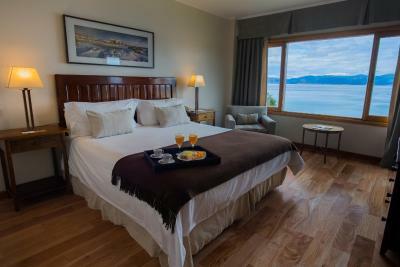 Beautiful views of Beagle Channel from Channel view rooms. Great atmosphere, very nice restaurant and solarium. Good spa with all the amenities and very nice staff. Easy to get in and out of town either by shuttle or taxi. The hotel is gloriously situated on the water - easy to walk down to the water's edge. There are wind blocks and heat posts for outdoor seating on the deck with just the most beautiful view. If you want an earlier dinner all restaurant food is available anytime at the bar, nice choices. We didn't end up using the hot tubs or pool but they were quite inviting. Staff was great. The staff. They are so welcoming and helpful. Great place to spend Christmas away from home. Beautiful views of the Beagle Channel. Large buffet breakfast with many selections. The hotel is included in the “small luxury hotels guide” and well deserved! Very comfy, great breakfast, great restaurant, very nice staff, amazing view and very nice spa. Courtesy drinks and hot chocolate included:) Not to mention Ushuaia is an amazing place. Would definitely return! 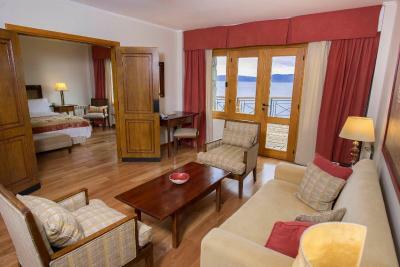 The hotel has clean rooms, with very good views of the beagle channel. 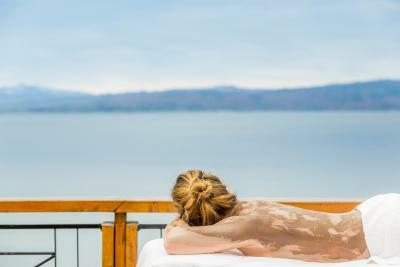 Los Cauquenes Resort + Spa + Experiences This rating is a reflection of how the property compares to the industry standard when it comes to price, facilities and services available. It's based on a self-evaluation by the property. Use this rating to help choose your stay! 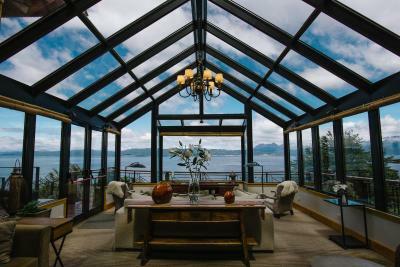 One of our top picks in Ushuaia.Boasting beautiful panoramic views of the Beagle Channel and the mountains, the 5-star Los Cauquenes Resort + Spa + Experiences offers luxury accommodations with a private beach area and tailored service in Ushuaia. Free WiFi access is provided. 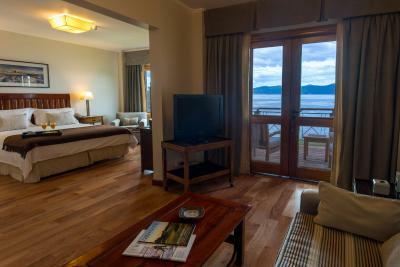 Each of the elegant and comfortable guestrooms at Los Cauquenes Resort + Spa + Experiences features panoramic views, a satellite TV, a mini-bar and extra long beds. They also include heating and a work desk. Bathroom facilities are private, and some include a spa bath. Interconnected rooms are available. 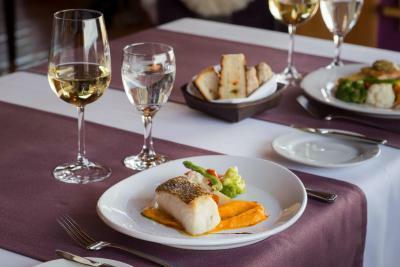 The hotel’s restaurant, Reinamora, serves a wide selection of regional and gourmet meals. The exclusive Wine Bar also offers an afternoon tea and cocktails at night. The property features a fully-equipped spa, a swimming pool and in/out hot tub. 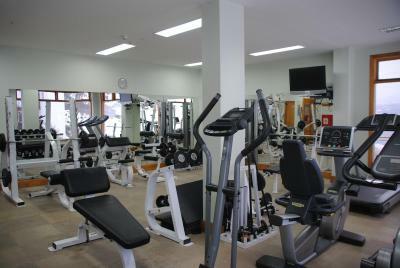 Guests can use the fitness facilities as well. 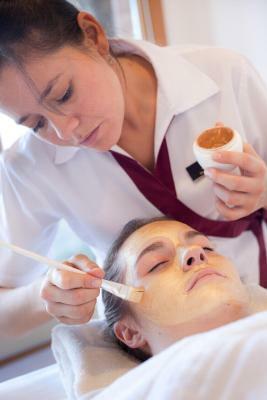 Massage and beauty treatments are available for a surcharge. 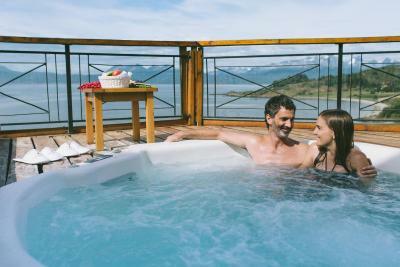 Los Cauquenes Resort + Spa + Experiences can privately organize a wide array of exclusive and personalized excursions for its guests. 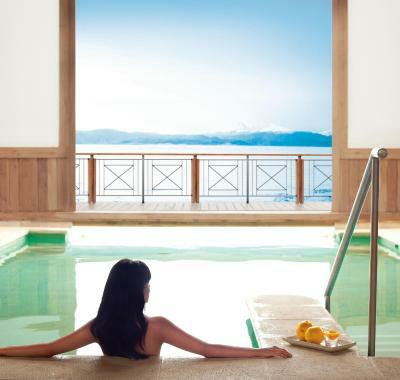 Within the property, guests can unwind in the fitness facilities, hot tub and terraces overlooking the sea. The hotel provides shuttles from the airport to the property for a surcharge. Guests staying here can also enjoy an American buffet breakfast and front-desk assistance. A free minibus runs at particular times during the day from the Los Cauquenes to Ushuaia's city center, which is about 15 minutes away. 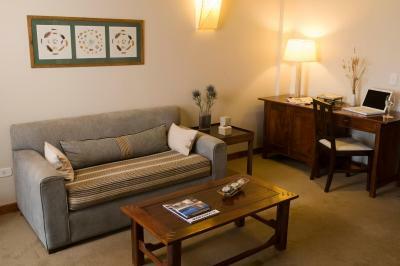 The hotel is 2.5 miles from the Malvinas Argentinas Airport. 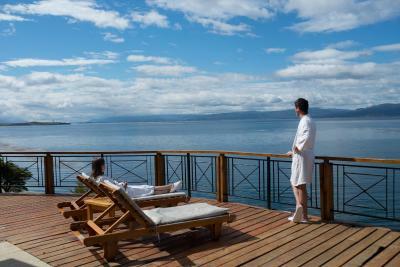 When would you like to stay at Los Cauquenes Resort + Spa + Experiences? The room features chic décor and panoramic views. This room is fitted with electronic locks, a telephone, a safety deposit box, a satellite-cable TV, a seating area, a mini-bar, an electric kettle and a hypoallergenic pillow. It includes a private bathroom with a bath tub. Please note the room cannot accommodate extra beds. Interconnected rooms may be available. The room features chic décor and panoramic views. It is equipped with electronic locks, a telephone, a safety deposit box, a satellite-cable TV, a seating area, a mini-bar, an electric kettle and a hypoallergenic pillow The bathroom facilities are private and include a bath tub. Please note the room cannot accommodate extra beds. The room features chic décor and panoramic views. It is equipped with a safety deposit box, electric locks, a satellite-cable TV, a seating area, a hypoallergenic pillow, and a mini-bar. The bathroom facilities are private and include a bath tub. It features luxury branded toiletries and a Nespresso Coffee Machine. This family room features a panoramic view and is equipped with a safety deposit box, a satellite-cable TV, a seating area, a hypoallergenic pillow, and a mini-bar. The bathroom facilities are private. The room features chic décor and panoramic views. 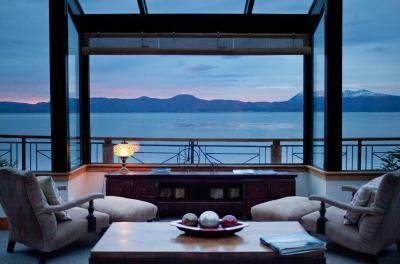 It features an independent living room with views of the Beagle Channel and a private beach deck. It is equipped with a safety deposit box, a satellite-cable TV, a seating area, a Nespresso coffee machine, a hypoallergenic pillow, and a mini-bar. The bathroom facilities are private and include a large spa bath and luxury-branded amenities. Please note the room cannot accommodate extra beds. 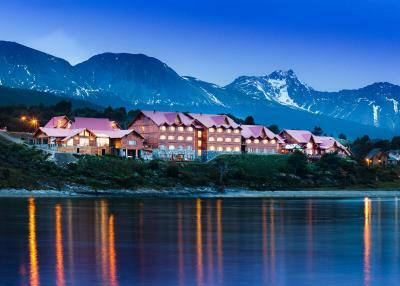 The package includes: Night accommodations in reserved category, B & B Services (Buffet Breakfast, Access to Spa and Gym, Shuttle Service to the City of Ushuaia in fixed hours and Wi-Fi in all rooms, 1 Dinner per person (2-step menu: main course + dessert + 1 nonalcoholic beverage + cafeteria service, 1 Half-day experience per passenger to choose between: Trails of the Park or Sailing the Beagle or Adventure of the Martial Glacier or Adventure Susana Summit (all include snack), Arrival and departure transfers (airport-hotel-airport) in regular hotel service. The room features chic décor and panoramic views. This room is fitted with electronic locks, a telephone, a safety deposit box, a satellite-cable TV, a seating area, a mini-bar, an electric kettle and a hypoallergenic pillow. It includes a private bathroom with a bath tub and toiletries. Please note the room cannot accommodate extra beds. The room features chic décor and panoramic views. It's equipped with a safety deposit box, a satellite-cable TV, a seating area, a hypoallergenic pillow, and a mini-bar. It includes luxury-branded toiletries and a Nespresso coffee machine. The bathroom facilities are private and include a spa bath. It can accommodate a double bed and 1 additional single bed, or 3 single beds. 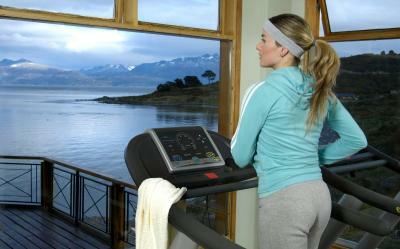 Los Cauquenes is the only hotel in Ushuaia with private access to the Beagle Channel. 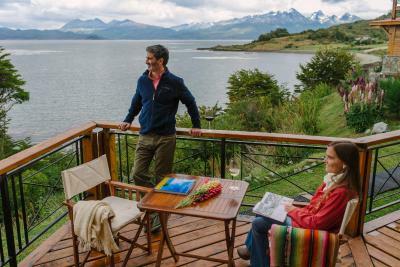 House Rules Los Cauquenes Resort + Spa + Experiences takes special requests – add in the next step! 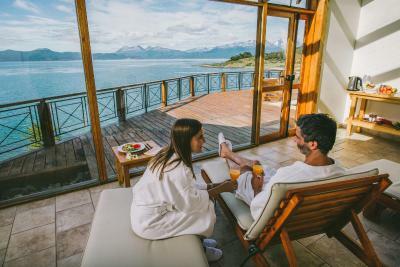 Los Cauquenes Resort + Spa + Experiences accepts these cards and reserves the right to temporarily hold an amount prior to arrival. During the ski season, the property offers guests children's entertainment, coordinated by specialized staff, and children's meals. Rates with Full Board Meal Plan includes two courses (main course and dessert), one nonalcoholic drink and coffee service. Please note that he Spa will be closed from June 3rd till June 12th, 2019 (inclusive) for maintenance, leaving the gym & massage rooms available. Children under 16 years old can access the swimming-pool from 9am to 12pm, and from 3pm until 7pm. They must be accompanied by an adult all time. Nice place. The breakfast was very extensive, the facilities were great. The road into town is awful. Although it only takes 20 mins or so it is such a bumpy ride. It almost put you off going into town. The hotel whilst nice could do with a face lift in my view. I would not consider it 5 star as it could do with a bit of investment. Room is very noisy. It feels that the guest next door are in your room. Room is very hot. Meals in the restaurant were disappointing for the price. Great views of the Beagle channel. The hotel is a real gem. The whole area of ​​the hotel is very quiet and relaxing. The view of both sides of the hotel is breathtaking. 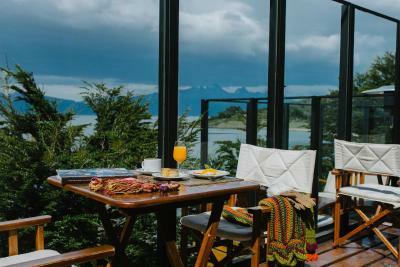 I liked sitting in hotel´s common areas overlooking the Beagle Channel, I liked tasty breakfast with fresh strawberries and cherries and I liked wery kind and helpful staff . Rooms were very clean with lot of ammenities, we got exactly the rooms we booked. I have seen many beautiful places while traveling through Argentina , but the best thing I always recall is the view from the hotel's terrace and the time spent on the beach in front of the hotel. Room not available at arrival. Location is a bit far to walk from town but shuttle bus and cheap taxis make up for that. Impeccable service upon arrival and throughout stay and made to feel welcome. The hotel is not close to town - which was fine for us and taxis are really easy - the hotel will call for one and in town they are easily available. Just something to consider while making your plans.